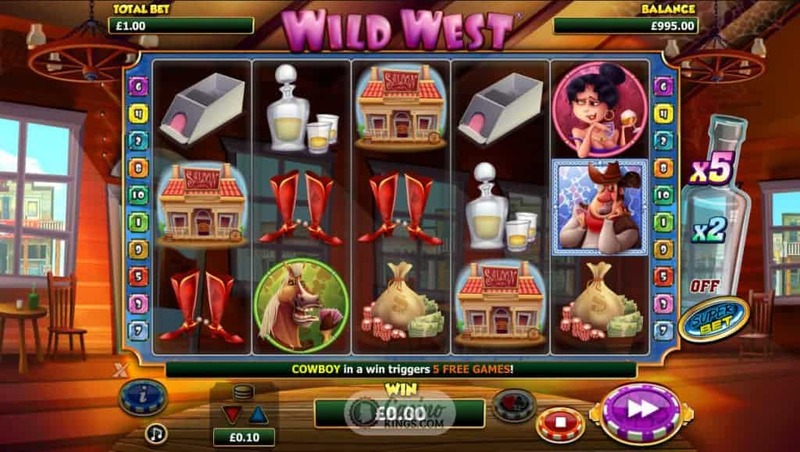 If ever there was a genre that is rife for a slot send-up it is the Western, and what better outfit to dish it out than the Wild West Slot from Aussie gaming house NextGen Gaming? Y’awl better hitch up your britches, because this is one rip-roarin’ tour of the West that is gonna send your winnings off like a blast of dynamite in a gold prospector’s pantyhose. As ever with Next Gen games, the reel case is attractively housed. The setting is a Wild West saloon, oil lamp chandeliers wobbling, presumably in the waft from the swinging doors of the cathouse. I always prefer online slots in which the reels are decorated purely by symbols, and the artwork here is neatly drawn and perfectly evocative. Whisky Bottles, Dealer Shoes, Cowboy Boots, a card playing Horse, the Saloon of dreams, an alluring Madame and, of course, our eponymous Cowboy. Naturally he is our Wild, and appears on reels 3, 4 and 5. 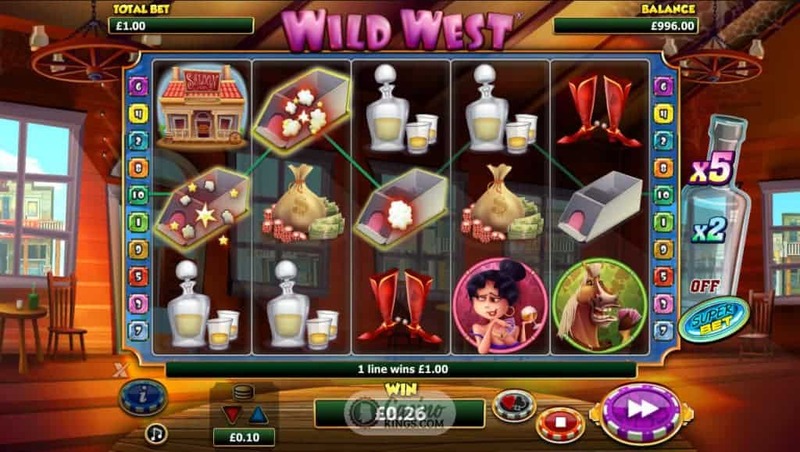 When he forms part of a winning combination he will trigger the game’s Free Spins bonus feature, with a “Yee” and a “Ha” and a double blast of his six-shooter gun. Well, you would, wouldn’t you? 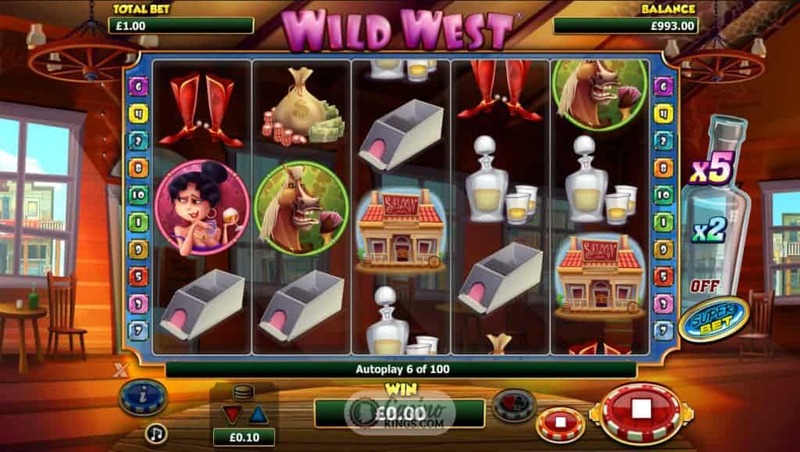 Wild West Slot is played over 10 paylines, presumably so these uneducated cowboy rustlers will be able to keep count. One thing we can all keep count of is Next Gen’s Super Bet™ feature – we play 10 lines plus 10 coins to land a x2 multiplier and 10 lines plus 40 coins for a x5 multiplier and bring the big wins home. 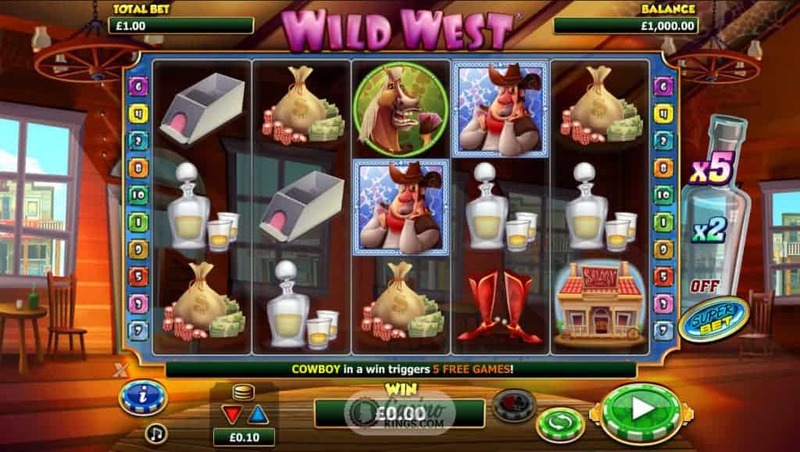 Our Wild Cowboy is the one to watch, and when he forms a winning combination he launches the Free Spins feature – the Trigger Win. There are only five free spins on offer, which may seem disappointing, but they can be re-triggered during the free games. Also, we have a new symbol – the Chip Stack. Each Chip Stack symbol awards the Trigger Win amount, and this is when our gameplay Super Bet™ tactics really come in to play. The bigger the Trigger win, the bigger the Chip Stack prize. If ever there was a slot that deserved a Gamble Feature, it is this one. Next Gen’s trademark Gamble offers a 2x multiplier for a correct colour pick on the flip of a card, and a 4x multiplier for the correct suite. Bourbon optional. 10 paylines may seem like slim pickings but to keep the buzzards off your gizzards you’ll have to use your rootin’ tootin’ Cowboy skills and bag those pesky Chip Stacks. Which translates as: have some jolly good fun, won’t you?